Kilchoman Church. 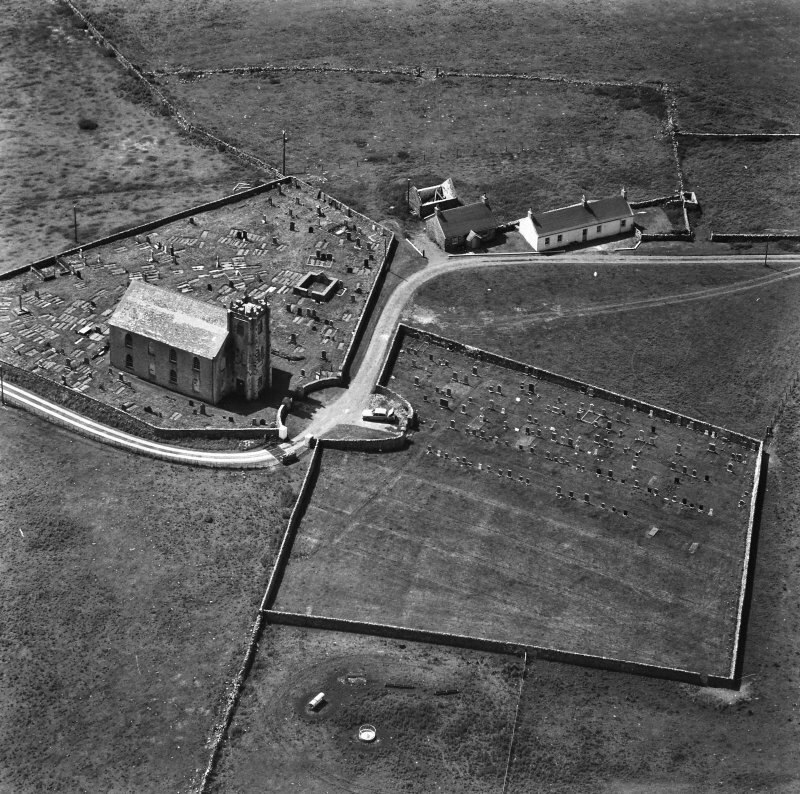 Aerial view of church and graveyard. Kilchoman Church. 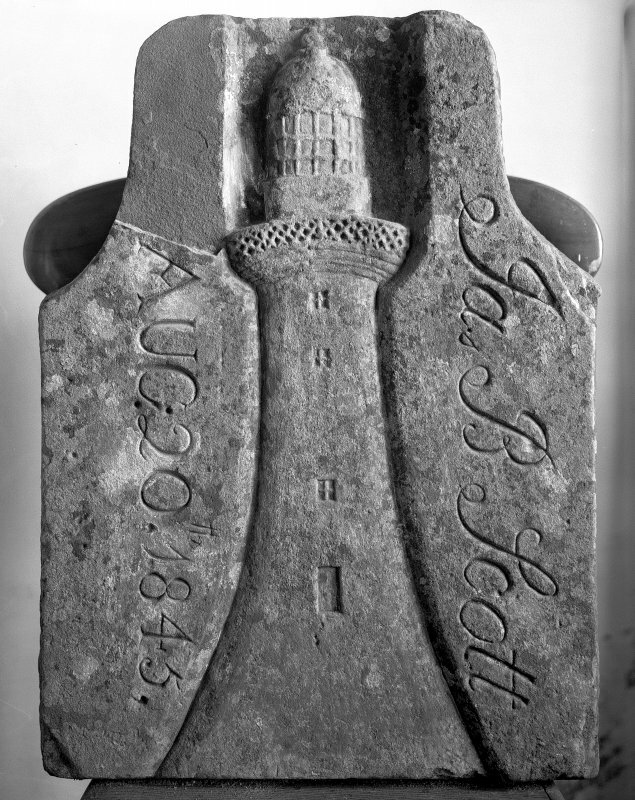 View of Lighthouse keeper's headstone, J.B.Scott, 1845. 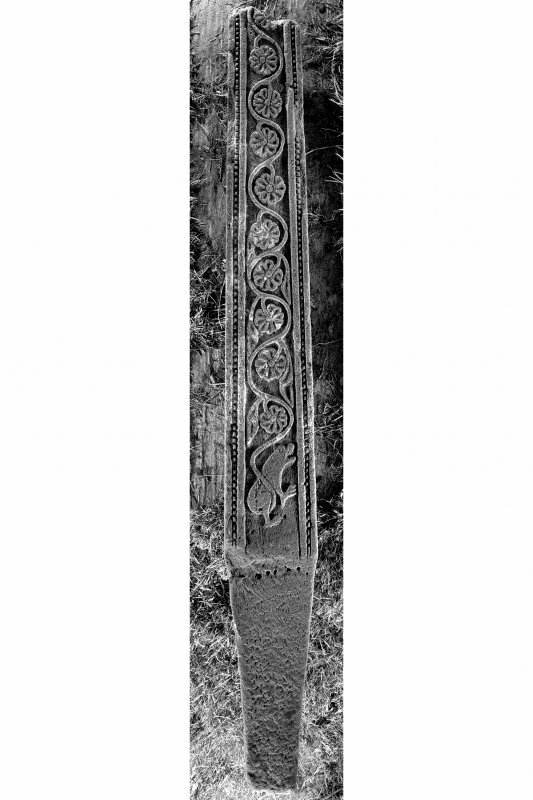 West Highland Cross-shaft, back, KG13, Kilchoman Church. View of cross-shaft. 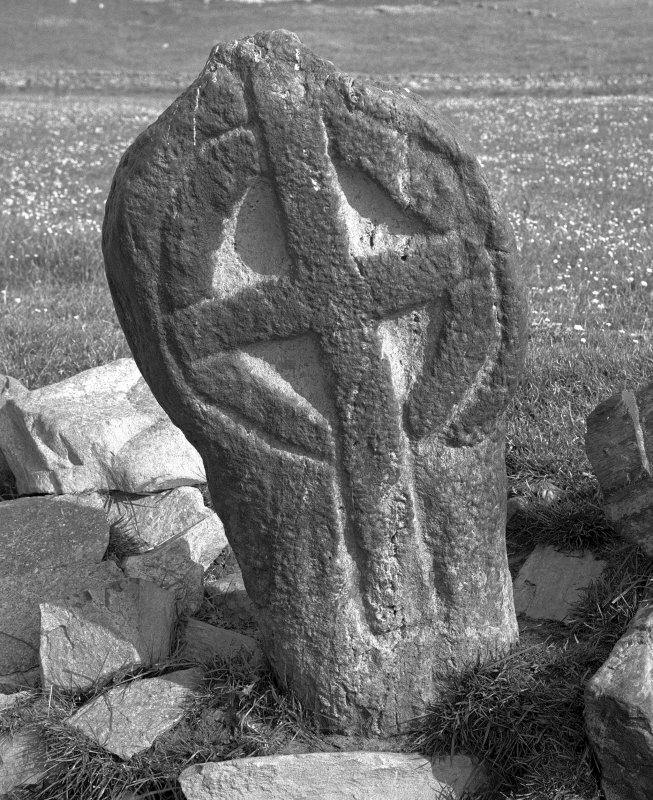 Medieval Cross, Kilchoman Church. Detail of shaft, face A (1B 217). West Highland Stone, Kilchoman Church. View of stone KG 7. 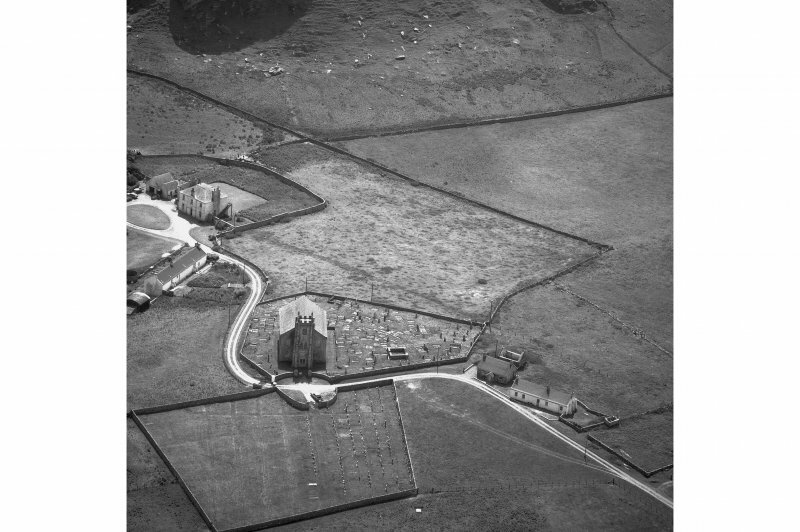 Oblique aerial view of Kilchoman centred on the church, burial-grounds and manse, taken from the S.
Late Medieval cross, Kilchoman Old Parish Church. View of West face of cross. 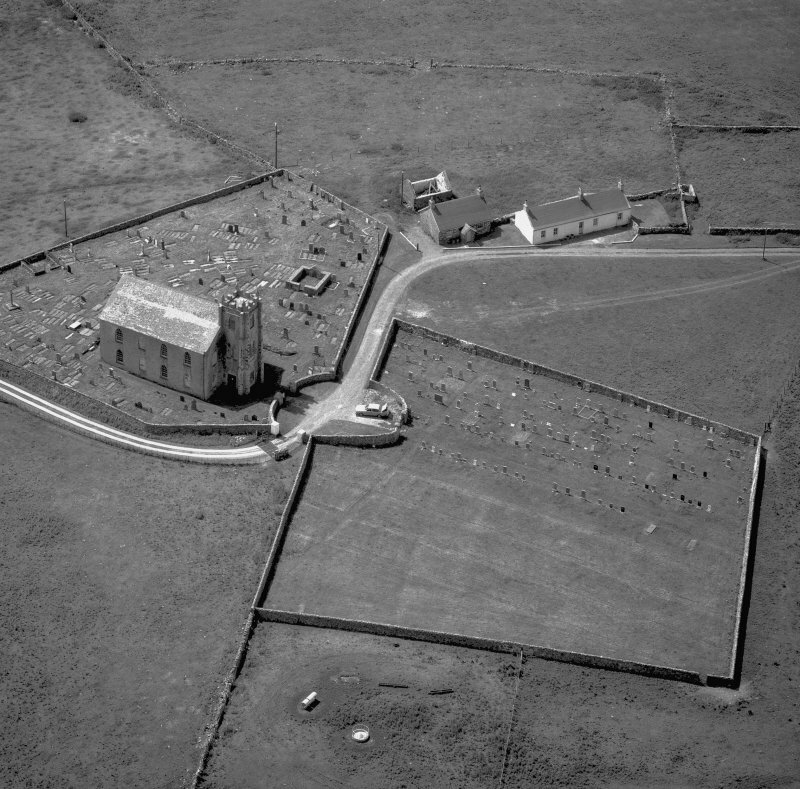 Kilchoman Old Parish Church. 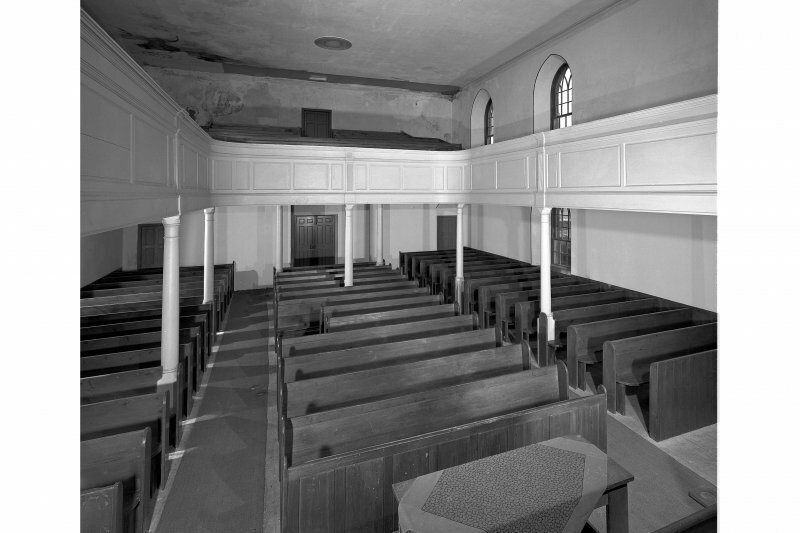 View of interior showing gallery. Kilchoman Old Parish Church. 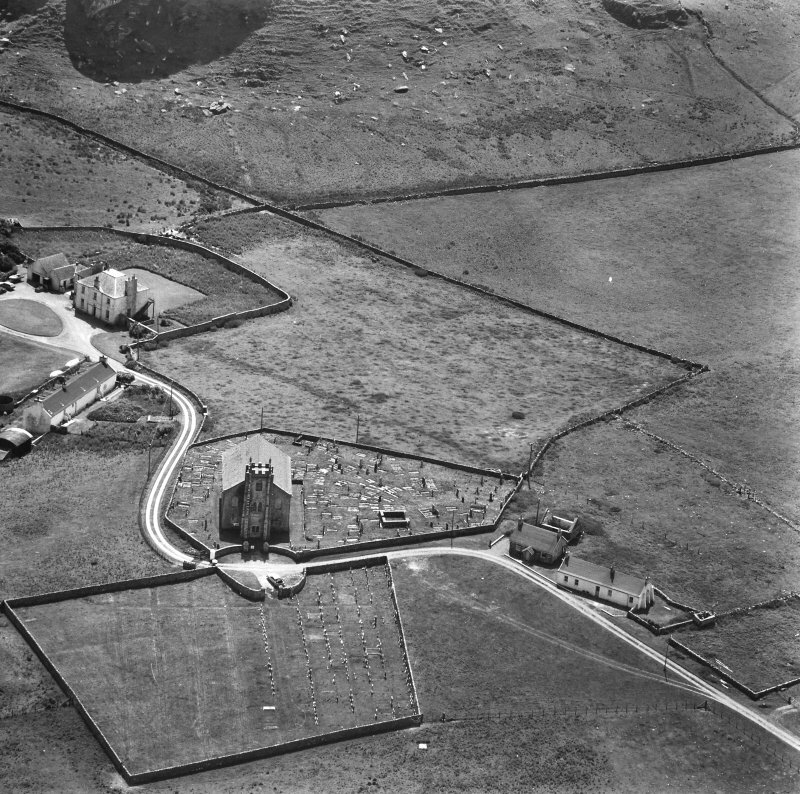 Aerial view of Church, graveyard and manse. 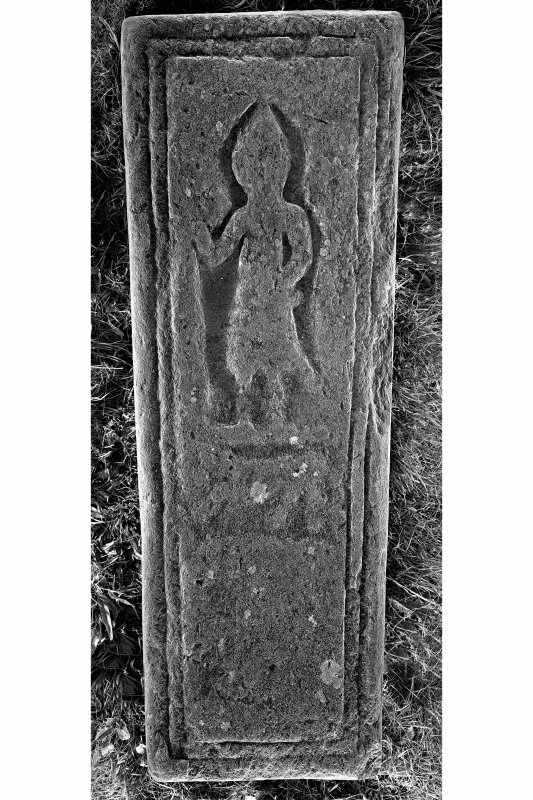 Graveslab of Lachlan Campbell, 1689, Kilchoman Church. View of graveslab. 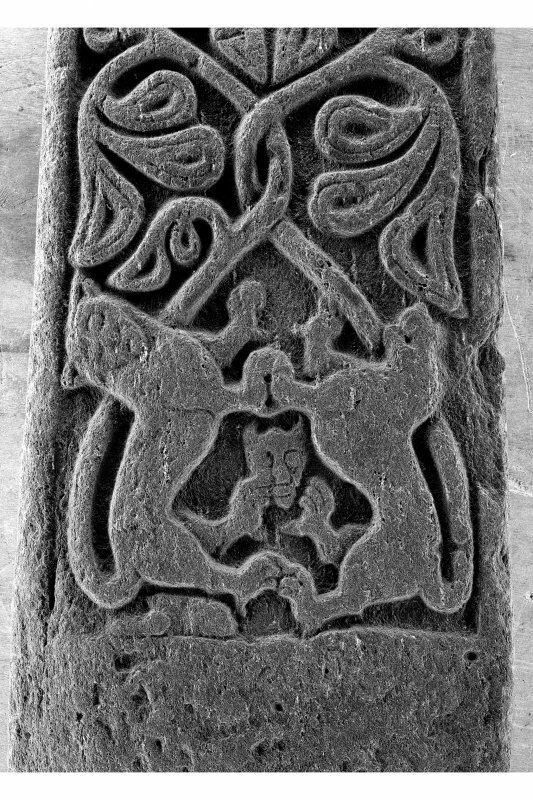 Late Medieval cross, Kilchoman Old Parish Church. View of East face of cross. 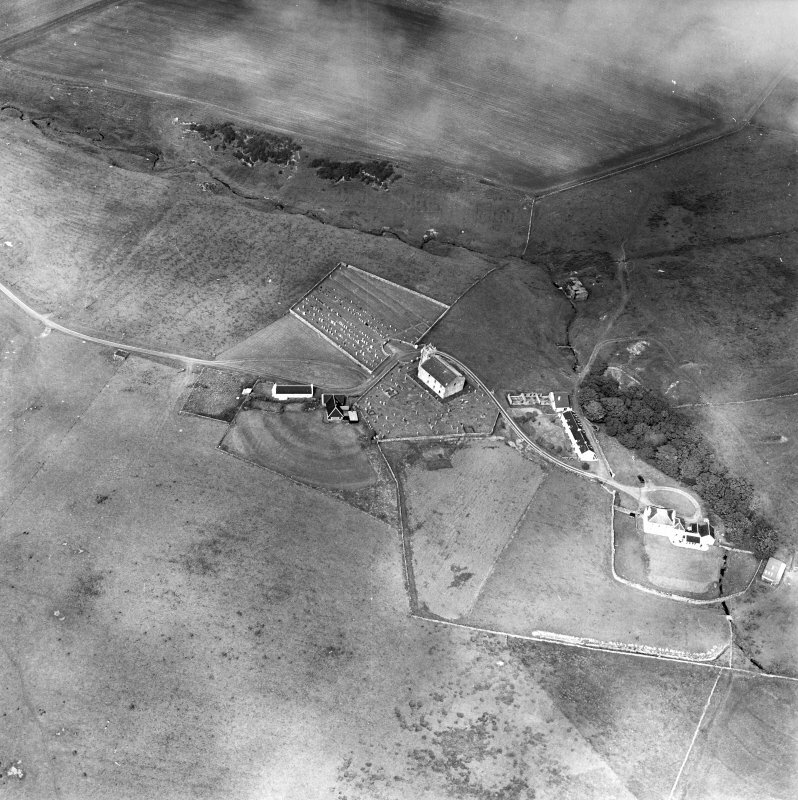 Oblique aerial view of Kilchoman centred on the church, burial-grounds and manse, taken from the NE. 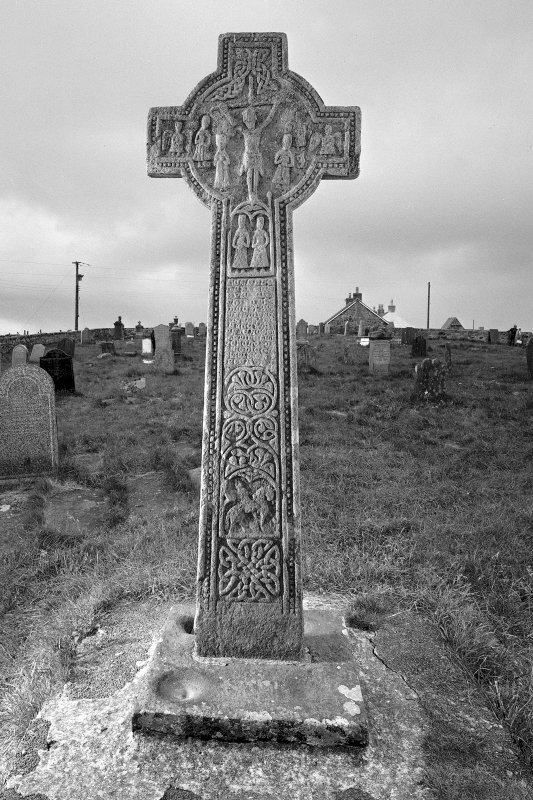 Medieval Cross, Kilchoman Church. 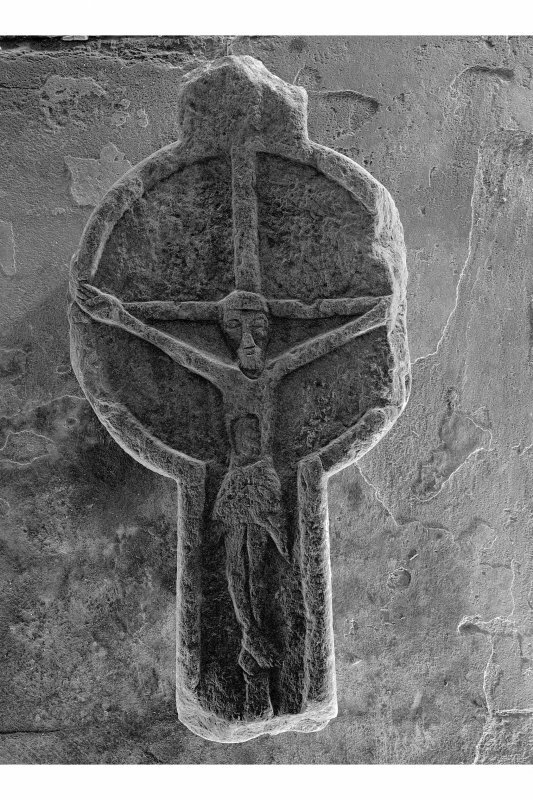 Photographic reconstruction of cross. West Highland Stone, Kilchoman Church. View of stone KG 8. Kilchoman Old Parish Church. 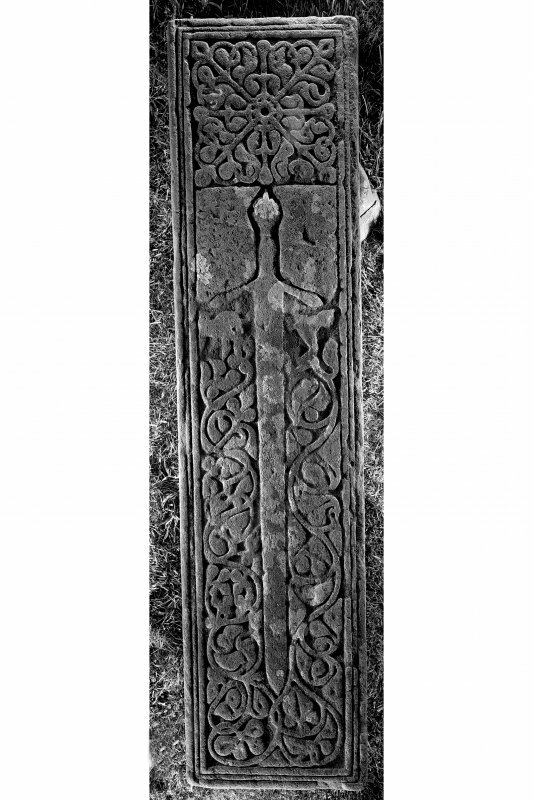 View of two West Highland Grave Slabs (KG 11) (KG 17). Fragment of cross, Kilchoman Old Parish Church. Detail of fragment of cross (obverse). 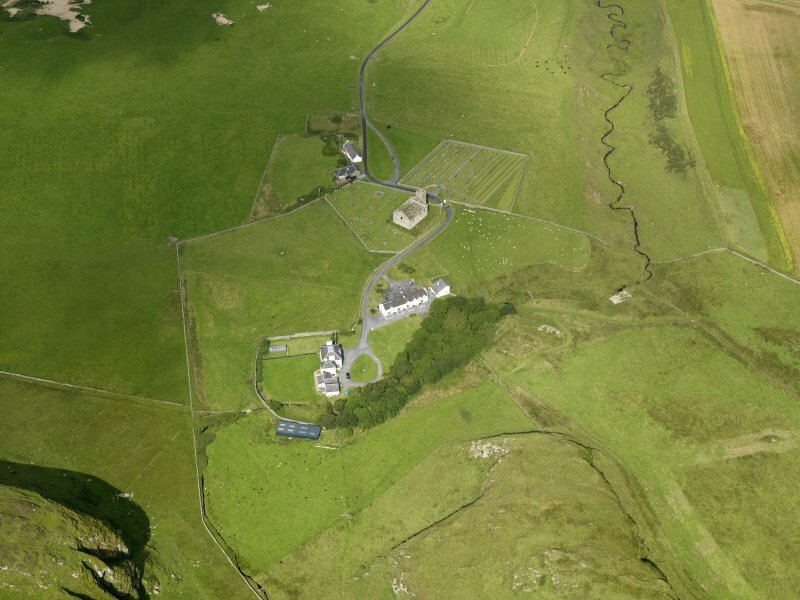 Oblique aerial photograph of Kilchoman, Islay, taken from the SSW. Kilchoman Old Parish Church. 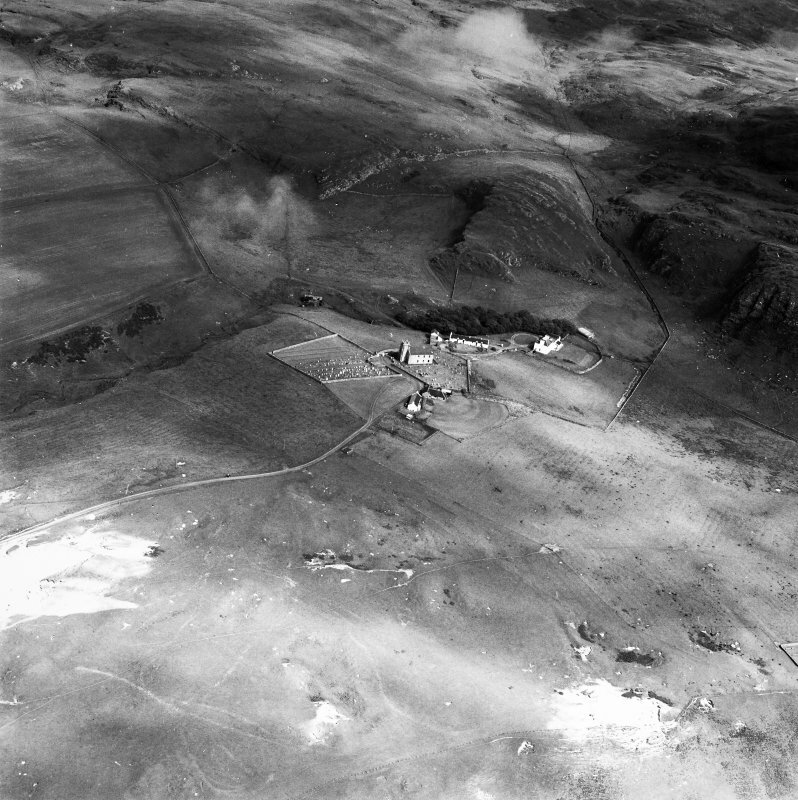 Aerial view from North East. West Highland Stone, Kilchoman Church. View of stone KG 6. West Highland Stone, Kilchoman Church. View of stone KG 1. West Highland Stone, Kilchoman Church. View of stone KG 22. 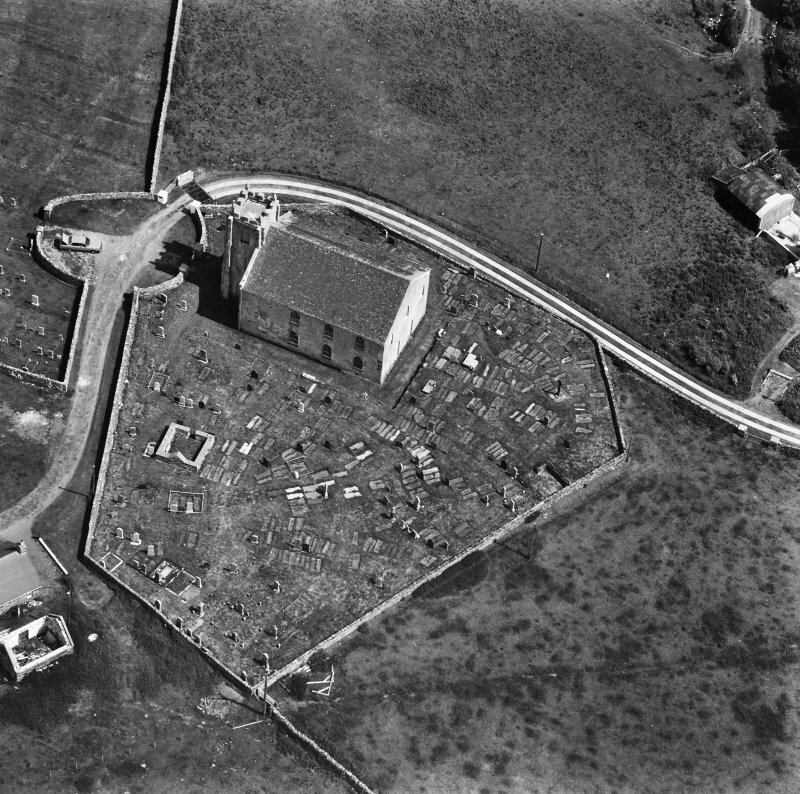 Oblique aerial view centred on the church, cemetery, manse and house at Kilchoman, Islay, taken from the SE. 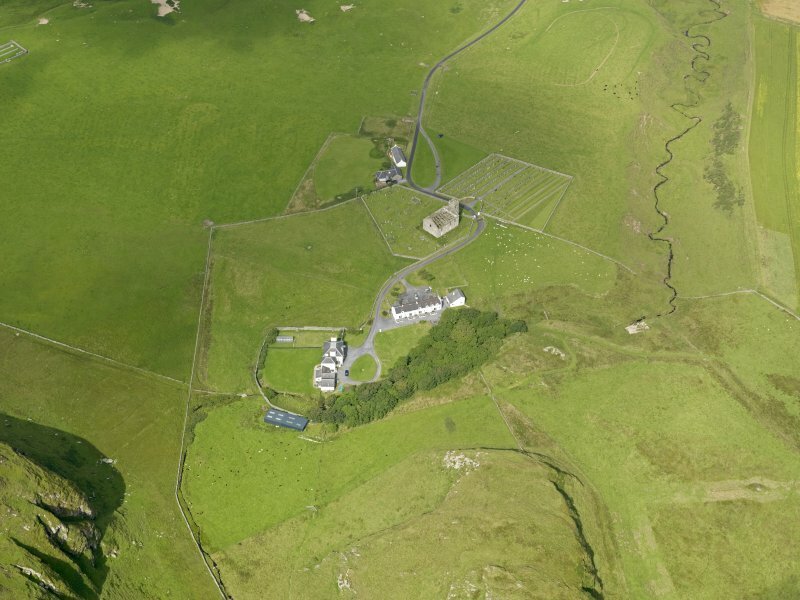 West Highland Cross-shaft, front, KG13, Kilchoman Church. View of cross-shaft. Fragment of cross, Kilchoman Old Parish Church. Detail of fragment of cross (reverse). Kilchoman Cross, Kilchoman Old Parish Church. View of pestle at base of West Highland Cross. 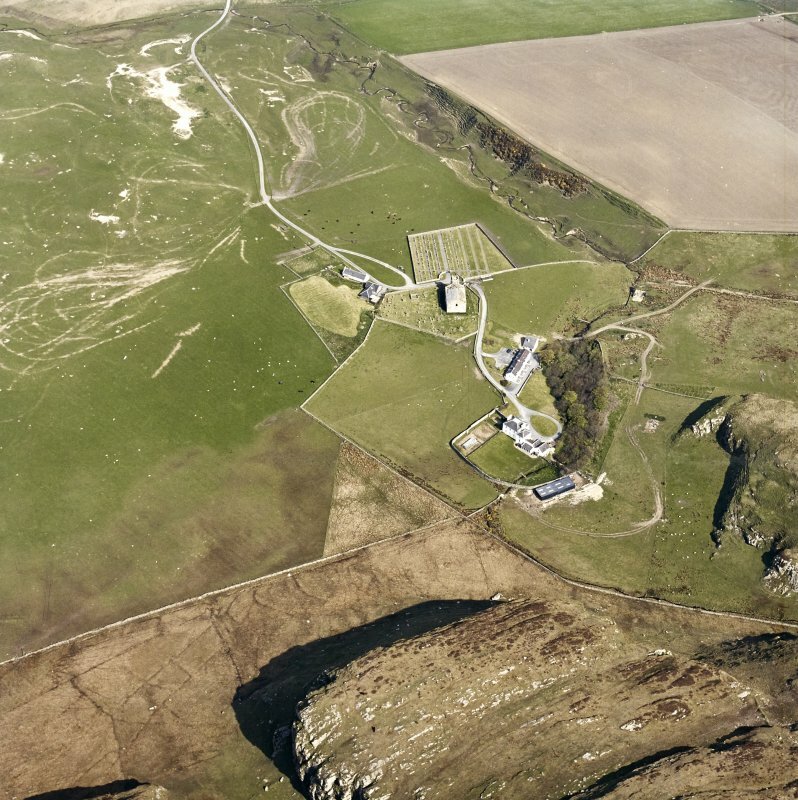 Oblique aerial view of Kilchoman centred on the church, burial-grounds and manse, taken from the NW. Oblique aerial photograph of Kilchoman, Islay, taken from the NNE. 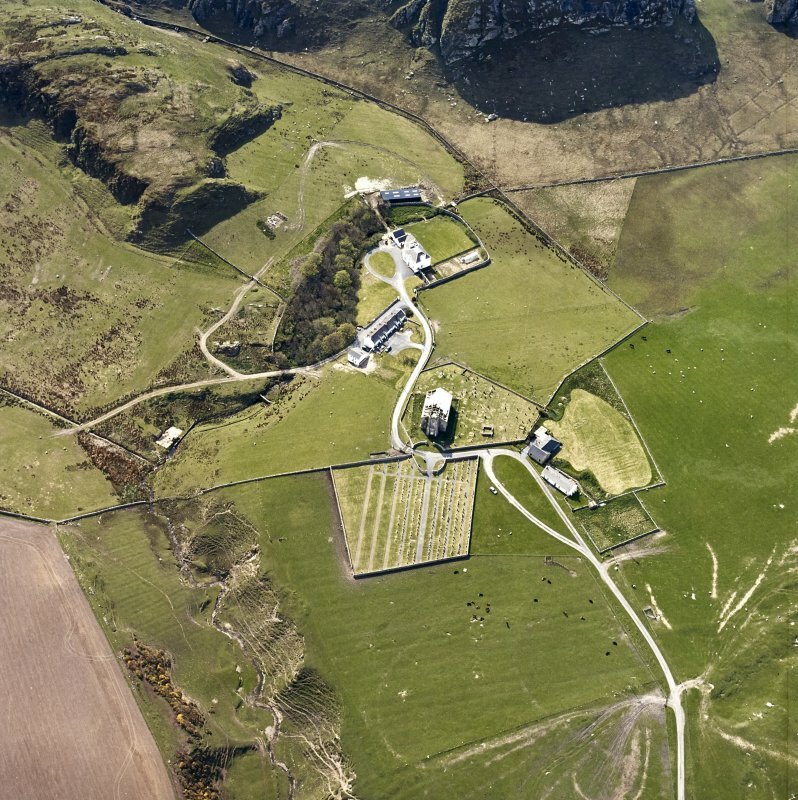 Oblique aerial view of Kilchoman centred on the church, burial-grounds and manse, taken from the SSE. Small cross, Kilchoman Old Parish Church. View of small cross showing crucifixion. 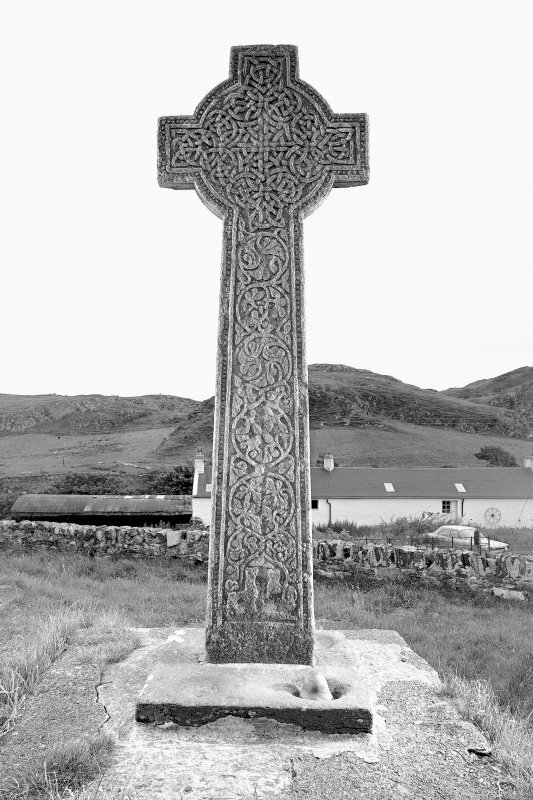 E.C cross (KG21), South West of Kilchoman Church. View of North West face. The name applies to the old burial ground surrounding the modern church (ONB 1878). 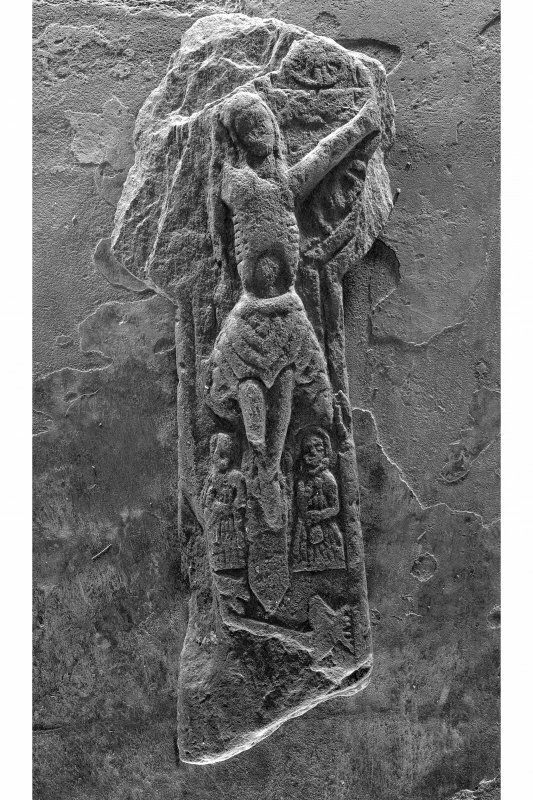 The fomer church was pulled down in 1825 to make way for its successor and nothing seems to be known of it, except that the site of the sculptured stone (No 35 on plan) said to mark the late 16th century grave of Sir Lauchlan MacLean at NR 2162 6322 was within the walls of the old church. The stone is in fact earlier than the late 16th century and bears the effigy of a priest. 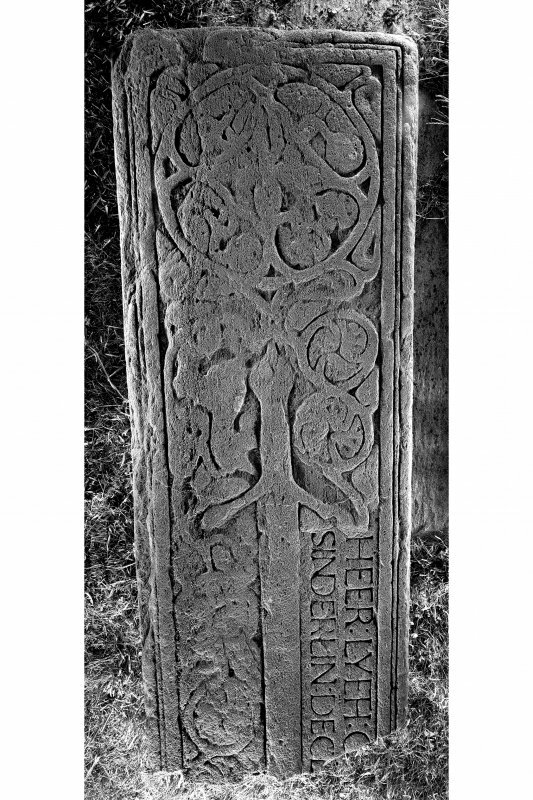 Other Medieval stones in the grave-yard are mostly 15th century, and include the 8ft 4 ins high 'Kilchoman Cross' at NR 2162 6330, at whose base are a pestel and 'cups' used in a wishing ceremony. Name Book 1878; R C Graham 1895; W D Lamont 1972; R W B Morris 1969. 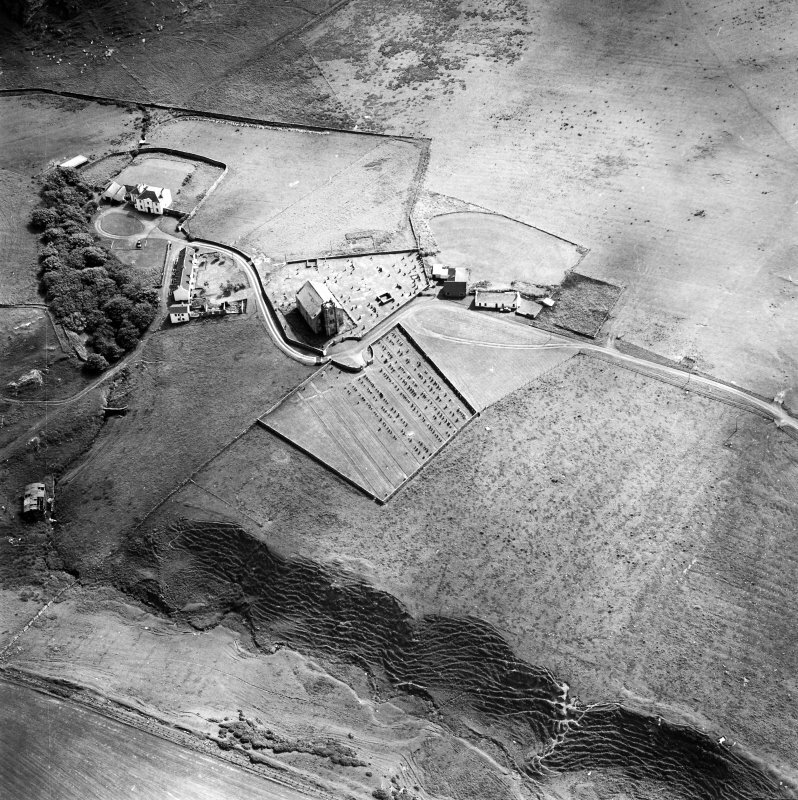 The old burial ground at Kilchoman is incorporated within the present grave-yard but there is no ground surface evidence of the former church (the sculptured stone - No 35 on plan(4) - is at NR 2162 6321). 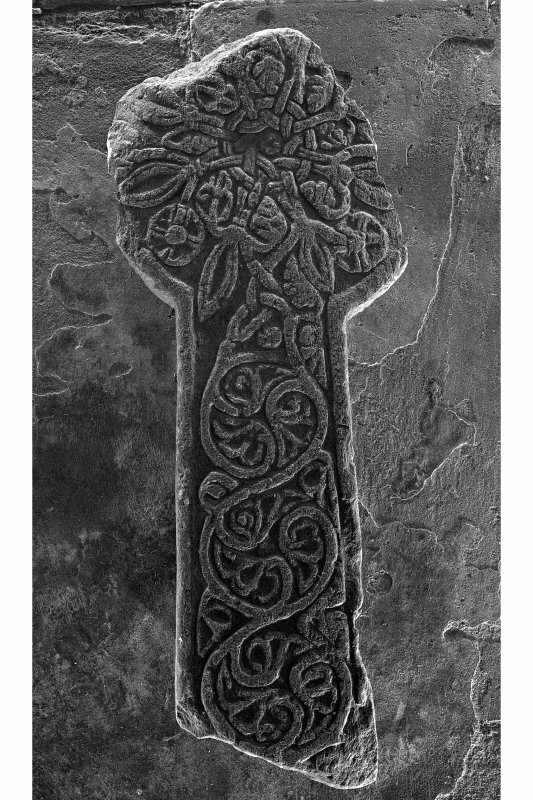 The Kilchoman Cross and the other Medieval stones are as described. Visited by OS (B S) 3 May 1978. Number 2 stands in a field 330m SW of the church (see NR36SW 9, NR 213 630). 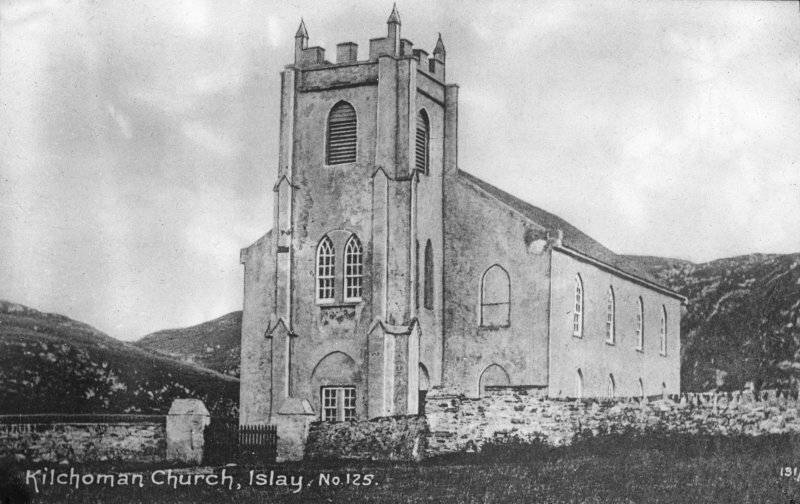 Number 1, which formerly lay beside a track on a hillside 380m ESE of the church (see NR26SW 1, NR 219 631), and numbers 14 and 26, which were formerly in the church porch, are now in the Museum of Islay Life, Port Charlotte. Number 12, formerly used to mark a grave in the churchyard, is in the National Museum of Antiquities of Scotland. Numbers 30 and 31 are in the Campbell of Ballinaby burial-enclosure and the remaining stones are in the churchyard, most of them in the positions marked on Graham's plan. illegible, and the sword-blade by plant-scrolls springing from the tails of two animals. (Graham, 1895). lona School, 14th-15th century. resembled that on number 3, and the inscription on each side of the sword-hilt is again illegible. The undamaged edges of the hand-grip show traces of horizontal ribbing, representing some form of binding or decoration. (Graham, 1895). lona School, 14th-15th century. to plant-scrolls which surround a central sword similar to that on number 3. (Graham,1895). lona School, 14th-15th century. interlaced foliage, and then a central sword similar to that on number 3, flanked by plant-scrolls springing from the tails of animals. 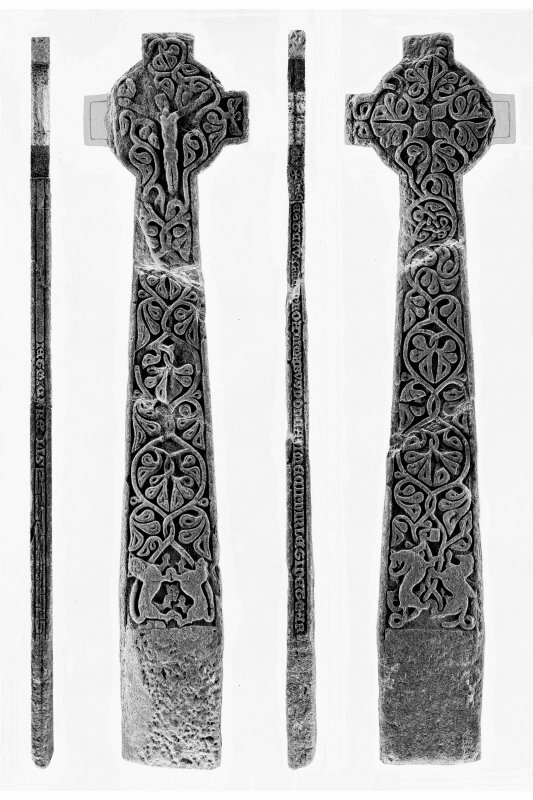 To the right of the hilt is a panel for an inscription, now obliterated. (Graham, 1895). Probably lona School, 14th-15th century. (Graham, 1895). Probably lona School, 14th-15th century. 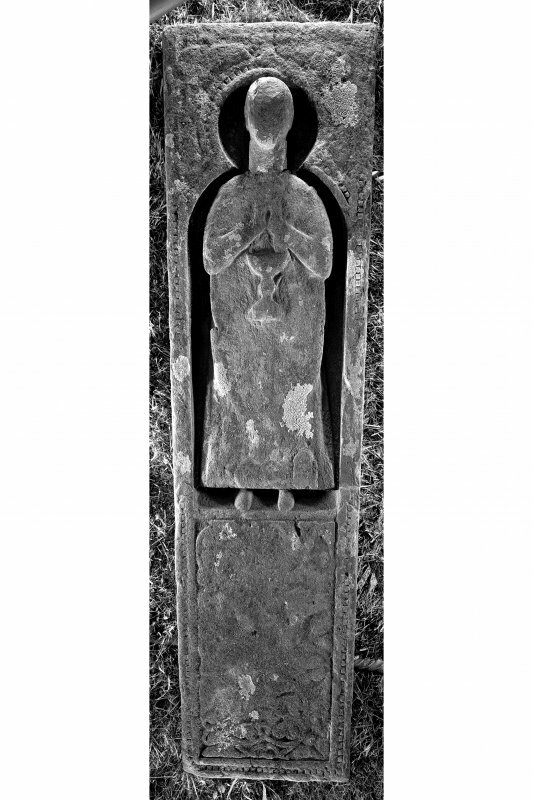 priest, standing in a deeply incised cusped niche ornamented with nail-head, occupies the upper two-thirds of the stone, the head being in high relief and the rest of the figure in false relief. The figure wears Eucharistic vestments and at the side, where it has been protected from wear, it can be seen that the chasuble and the high apparel at the neck have been richly ornamented, with foliage and interlace respectively. The hands are joined in prayer, and beneath them is a chalice. 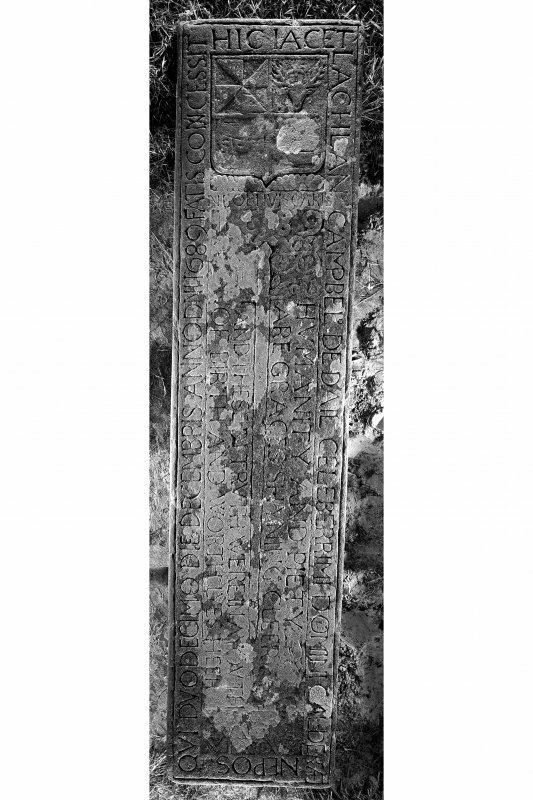 Traces of foliage decoration are visible in the lower part of the slab. (Graham, 1895). lona School, 14th-15th century. worn. It bears the effigy of a priest in Eucharistic vestments, standing in a cusped ogival niche. The apparel at the neck has been ornamented with interlace similar to that on number 9. 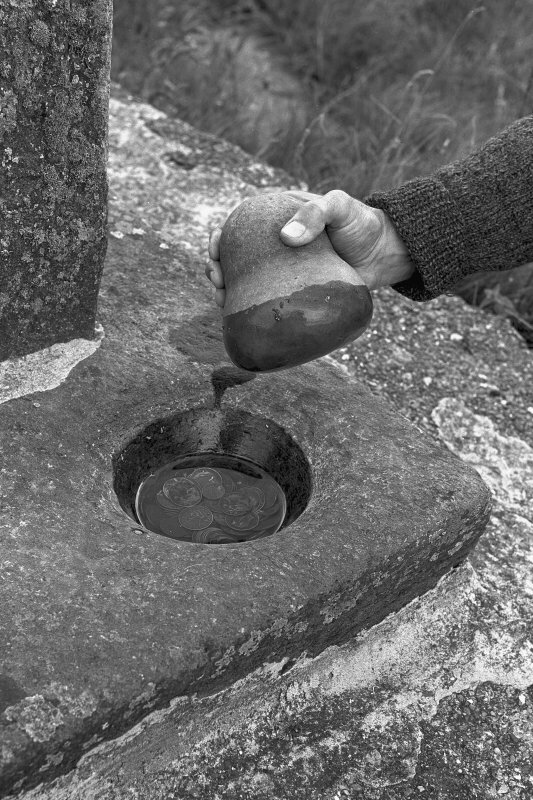 There is foliage-ornament in the top corners of the slab, and also a chalice in the left corner, while there are traces of a foliated cross at the foot. (Graham, 1895). lona School, l4th-15th century. carved below them. There are traces of foliage at the foot of the slab, but the remaining ornament has been obliterated by two inscriptions commemorating Duncan McLachlan, who died in 1732, and his wife Marrion dark who died in 1755. (Graham, 1895). lona School, l4th-15th century. 'This is the cross made for the souls of Duncan MacNerlin and Mary and Michael '. 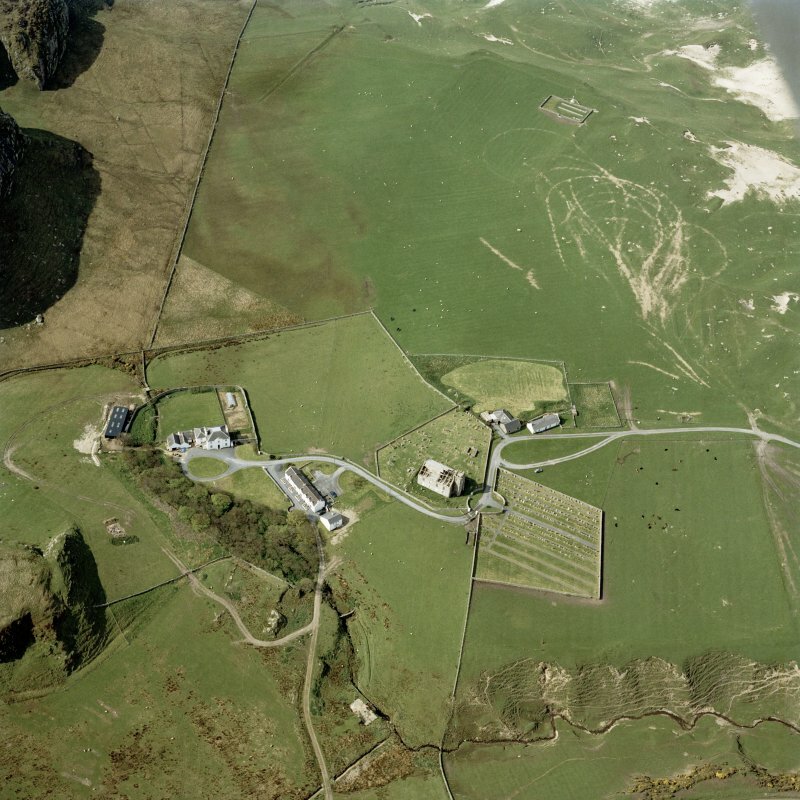 Duncan MacNerlin (meic inn fhir leginn) belonged to a family claiming descent from the fer leginn or lector of a Celtic monastery, and Donald MacNerlin, possibly a son of Duncan, was vicar of Kilchoman from 1427 to 1462 or later. (Steer and Bannerman ; Graham, 1895; PSAS, 61 (1926-7), 149-50; ibid,65(1930-l), 19-20; ibid.,66(1931-2), 442-5). lona School, probably late 14th - early 15th century. AC OMN/IUM FIDELIUM/DEFUNCTOR/fuJM ET DICTI . . .
1895). 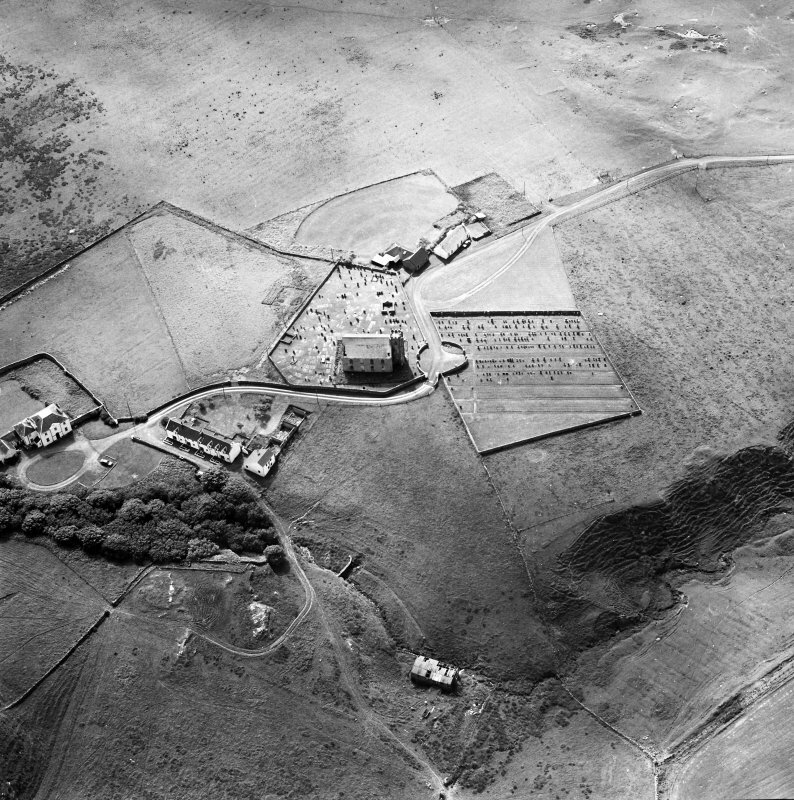 lona School, 14th-I5th century. inscription in Lombardic capitals which begins + me IACET . . . ('Here lies,. .'); the rest of the inscription is illegible. At the foot of the slab is an inverted galley with a long mast but without a yard or sail. (Graham, 1895). 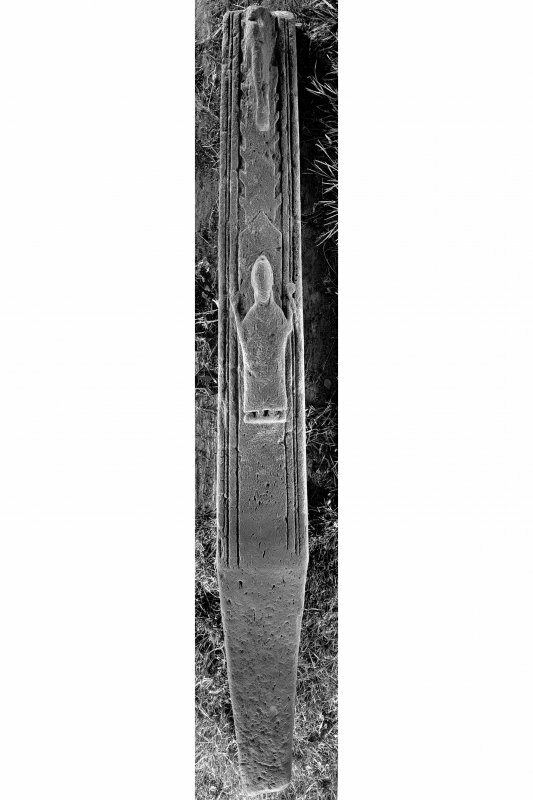 (18) Tapered slab bordered by a row of nail-head ornament between roll-mouldings, 1.83m by 0.51m; much worn. 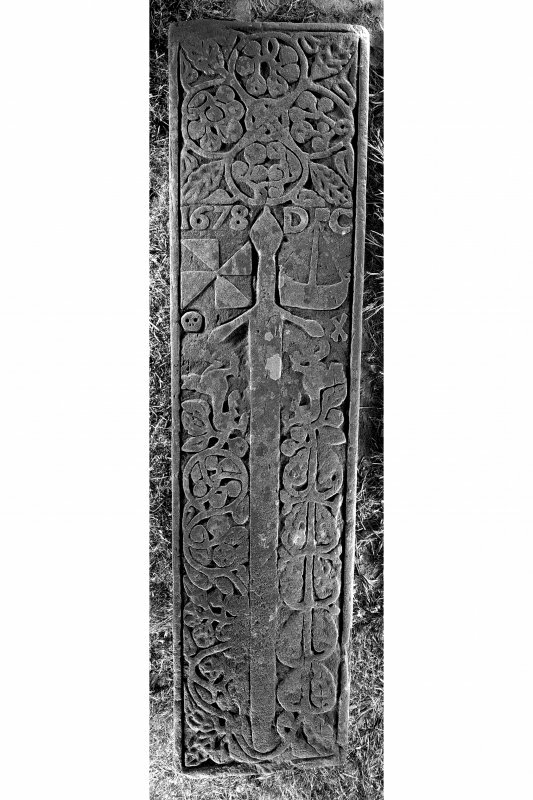 At the top there is a foliated cross, and then a sword similar to that on number 3, flanked by plant-stems, 14th-15th century. probably intended for an inscription. (Graham, 1895). 14th-15th century. while below the niche is an animal. 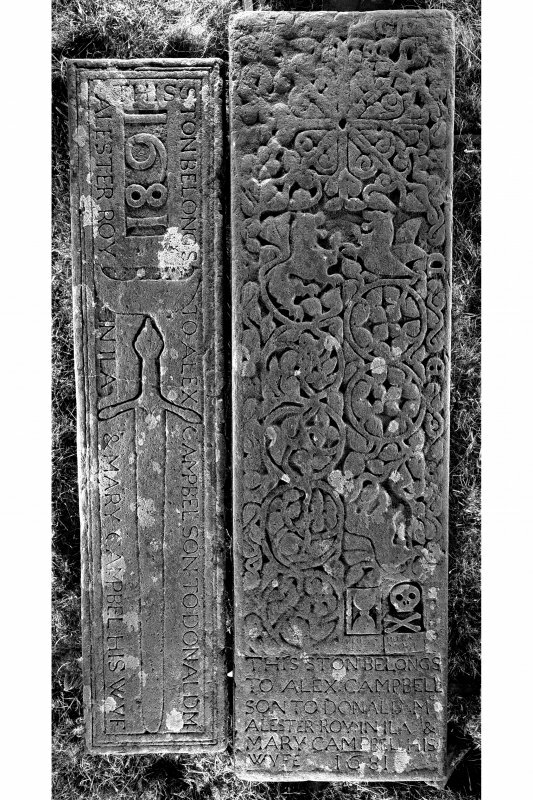 The decoration in the lower part of the slab has been effaced, 14th-15th century. died in 1783. (Graham, 1895). 14th-early 16th century. central sword is flanked by plant-scrolls, 14th-early 16th century. the decoration is effaced, 14th-early 16th century. Bannerman, ). 14th-early 16th century. double-handed sword with round pommel and horizontal quillons expanded at the ends. Local, 16th century. appears to be a chalice. Local, 16th century. At the foot there is a panel containing the inscription VIVIT POST/FUNERA/VIRTUS ('Virtue lives on beyond the grave'). 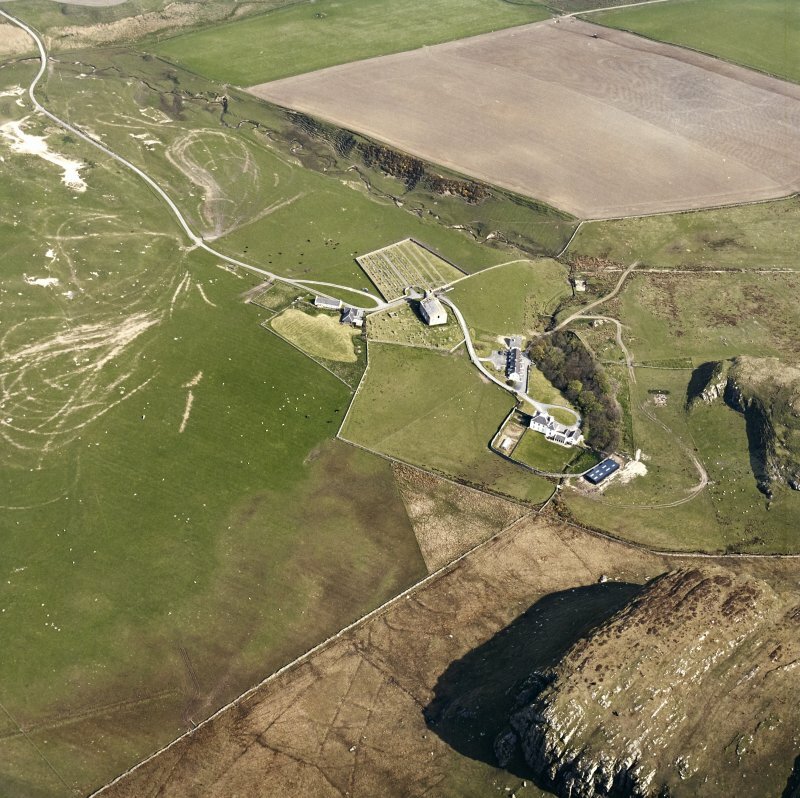 Lachlan Campbell, who obtained a wadset of Daill in 1685, was grandson of John Campbell of Cawdor (d. 1592) and nephew of Sir John, the first Campbell owner of Islay." inscription VIVUNT FUNORA (sic) VIRTUTE (7'The dead live on by their virtue'). 2nd, a stag's head cabossed; 3rd a galley, sail furled, oars in action; 4th, ?gyronny of eight. Ellister, who died in 1754.
slab evidently commemorated a member of a family claiming descent from the Camobells ofCawdor. 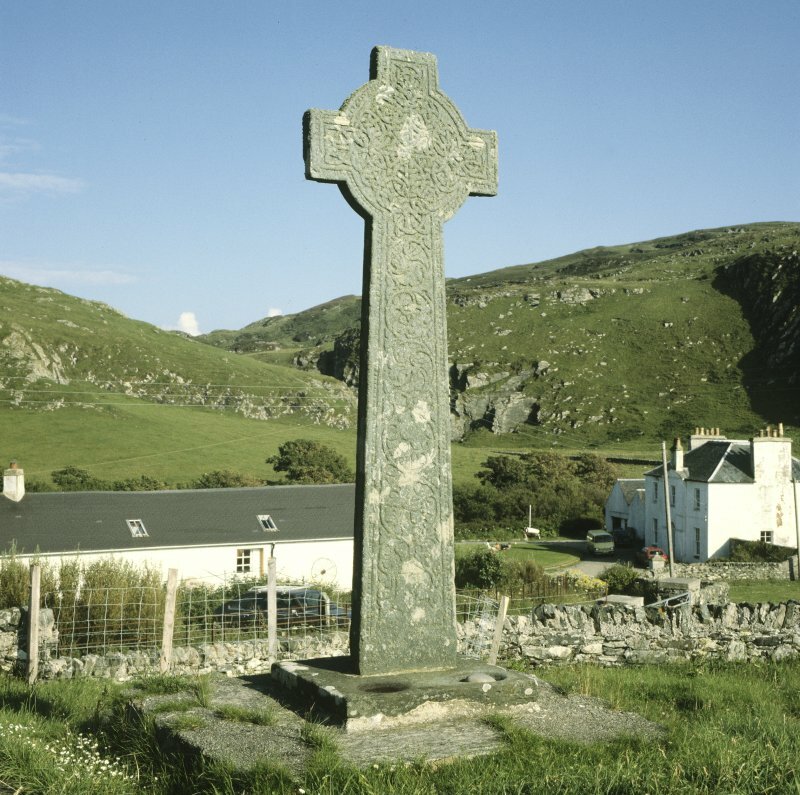 Scheduled as Kilchoman Church, Cill Chomain Cross and tombstones... in Kilchoman burial ground. Information from Historic Scotland, scheduling document dated 8 December 2000.